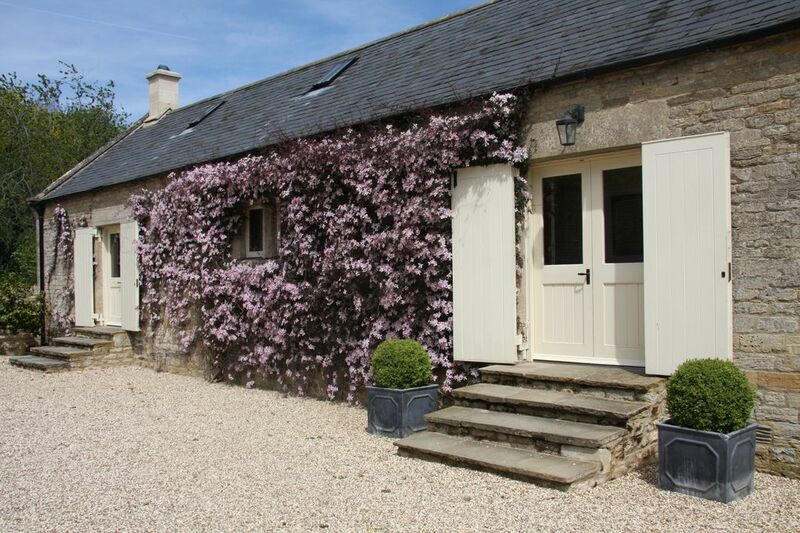 The Granary is in a rural location, perfect for families, couples and pets. 2 bedroomed, 2 bathroomed Granary with large reception room in rural location. Aylworth is predominantly a family run home and farm in the heart of the Cotswolds, an Area of Outstanding Natural Beauty, close to many historic towns and villages. The Granary has been converted and upgraded to a very high standard and offers a spacious open -plan beamed living/ kitchen/ dining room with open fire, wooden floors and a modern fitted kitchen with granite worktops. There is a double bedroom with ensuite shower room and twin room with ensuite bathroom and hand held shower. Stairs offer access to a mezzanine sitting room overlooking the ground floor. The Granary sleeps 4 plus a child, cot available and 2 well behaved dogs are allowed to stay at any one time. Aylworth is home to numerous animals including dogs, ducks, chickens and horses. The Granary offers use of the well maintained gardens, BBQ area and tennis court. There is direct access to many bridleways and footpaths such as The Windrush Way. Naunton 1 mile, Bourton on the Water 4 miles, Stow on the Wold 7 Miles Cheltenham 12 miles. The Granary is perfectly situated for exploring the Cotswolds. Should you want further accommodation Bed and Breakfast accommodation is also available in the Manor itself. John and Jo bought Aylworth in 2002 as an ideal home to raise their family. Johnny is a dentist and works in Cheltenham, Jo worked in the city before 'retiring' to the country. They spend their time running the farm and looking after their guests and animals. As well as the Self Catering cottage Jo runs a bed and breakfast business from the Manor, spends quite some time in the garden and an inordinate amount of time with the horses and her dogs. Their two children are now in their twenties but enjoy spending time at Aylworth often with friends. There has been a house at Aylworth since Medieval times, infact there is a mention of it in the Domesday Book. The house is surrounded by its farmland and a small hamlet of converted farm buildings. The house and Granary were remodelled in the Georgian era and was renovated by Johnny and Jo when they bought it. There are stunning views over the Cotswolds hills and valleys, excellent walking, the property is situated on the Windrush Way footpath. Uniquely both Johnny and Jo are committed to renewable energy and conservation and the house and Granary are powered by PV panels and a biomass boiler. Large well maintained garden with access from The Granary drive, please note that there are ponds for those with small children. Hard tennis court on site. Naunton Downs Gold Course, about 1 mile away. Perfect accommodation, location,owners, staff and animals. The property description provided on the website is accurate. Lovely peaceful place to stay out in the country yet not too far to drive to places. Owners very welcoming. Children loved all the animals especially being able to hold a newborn lamb! We are delighted that you enjoyed your stay and that the children enjoyed all the animals as well. Hopefully we will be able to welcome you back to Aylworth and that you might even see a little more sunshine next time?